There are some small business owners and entrepreneurs who have built a community around their brand by using a Facebook Group. The purposes of their Group varies, from sharing promotions, new product releases and special events with their preferred customers to utilizing a private Facebook Group as part of their online course. Historically, if you were the owner of a Facebook Page as well as a Facebook Group, they pretty much existed completely separately from one another. While these 2 Facebook properties are still separate and distinct in how they function, Facebook has finally rolled out a way to better connect one with the other. Begin by visiting your Facebook Page and clicking on Settings –> Edit Page. Next, scroll down to the bottom of the Template section to find the Add a Tab button. Click on the Add a Tab button and choose to add a Groups tab. Drag and drop the Groups tab to whatever place in the tab order you want it. To do so, be sure to click on the icon with the 3 lines to the left of the tab names. Next, return to the main view of your Page, and click on Groups in the lefthand navigation. If you haven’t already created a Facebook Group, click to create one. Otherwise click on the Link your Group button. A pop-up will present you with all the Facebook Groups you admin to choose which one to link. After you choose one, it’ll showed as “Linked” in the list. 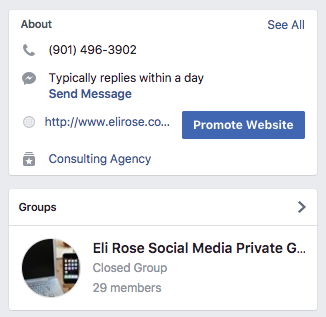 Your Facebook Page will refresh and you’ll notice the new box in the right sidebar that shows your Group name with an arrow to click to take you to it. 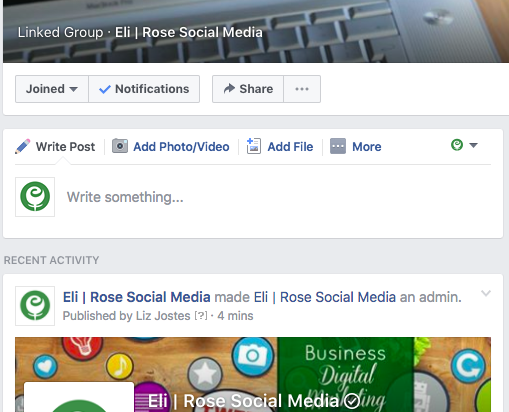 Once you visit your Facebook Group after linking, you’ll see text in the cover photo that says “Linked Group” and a post made that reads, “Eli Rose Social Media made Eli Rose Social Media an admin”. This means you can now continue to post in your Facebook Group as yourself, or as your Page. You toggle between your 2 personalities just like you would when leaving a comment on your Page. After connecting your Facebook Group to your Facebook Page, you’ll start receiving notifications for your Group as part of your Page notifications. Once you’ve connected your Group to your Page, the process of going Live inside your Group when on mobile requires an extra step. Here’s what it looks like using the regular Facebook app. Click on the arrow located to the right of your Page name. 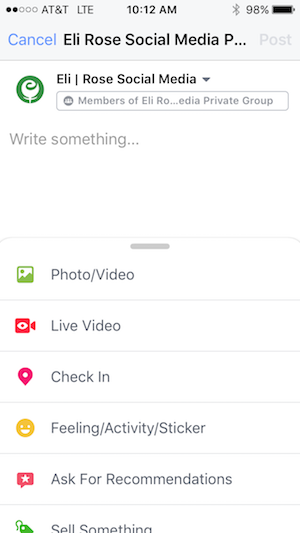 You’ll then be shown this screen below that asks you if you want to go Live in your Facebook Group as your Page or as yourself. 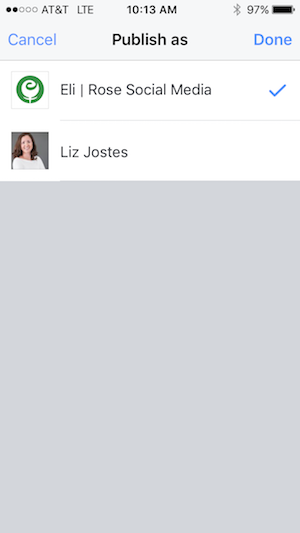 More recently, Facebook gave Group admins a couple other options for connecting your Group to your Page. When you visit your Facebook Group, click on the button with 3 dots located beneath the Group cover photo. From this drop down menu, you have the option to Link Existing Group, Create New Linked Group, or Create New Group. You can also link or unlink a Group by clicking on the Edit Group Settings tab. Great steps on how to do this! My question: What are the pros/cons of doing this? I saw this option in FB, but was not sure of the purpose…..the why….behind doing this? Thanks for any insight! Hey Cheryl! While I think there may be more use down the road (since FB never leaves anything 1 way for very long), it connects your Page to your Group in the sense that A.) people who visit your Page can much more easily see you have a Group and click to join it, and B.) you’ll receive Group notifications on your Page. Also, you will have the ability to post inside your Group as your Page instead of you (Profile). It stop letting me post to my page. How do I fix this? Are you having trouble posting to your Business Page as the Page? Or something else? You can post in your Group as yourself or your Page once your Page and Group are linked, but you aren’t able to post to your Page as your Group. Just looking to clarify so I can better understand your problem. If you let me know a bit more about what’s going on, I can try to help further. Thanks! I recently linked my page and my group and love it except for one issue. When on mobile I can’t seem to post as myself only as my page. When going live I now go live as my page which may be good in some aspects but I’m getting less live viewers since they don’t get the alert that I’m live unless they liked the page. Any advice or tricks I’m missing? Thanks! Hi Amy! When on mobile, are you experiencing this with the regular Facebook app or with the Pages Manager app? When you are talking about going live, are you doing that in your Group? Or on your Page? I have the ability to go Live in a Facebook Group from my regular FB app, or go Live on my Page from the Pages Mgr app. Is your app updated? I wonder if some reason it just hasn’t rolled out to you yet. hi, I hope you can help me… in my case I cannot find the way of connecting my Facebook page to my group. I tried to add the appropriate tab, but it is not available in the settings. do you know why that keeps not to be enabled for my page? should a do anything else? Hi Anna! Can you share your FB Page link with us so I can take a look? Do you see the option on the Page itself (not in the Settings) to connect your Group? You can email the link to Info@EliRose.com Thanks! I’m having the same issue. I linked the group on initial set up of my page, but now I can see the group tab, and it’s not an option in the “add tabs” section. When you are going to post in the Group, there’s a small icon on the top right corner of the New Update box that allows you to switch between your personal Profile and your Page. Just make sure to switch that before you publish an update. It’s the same when you leave a comment except the icon to switch between you and your Page is located in the comment section. Hope that helps! If I link my personal page to the group that I am administrator of , will I be able to include the group AND my personal data when I download a copy of my personal data from FB or will I only be able to download/back up the personal data ? Thanks in advance. Hello! If you are already an admin of a Group, you already have your Profile “linked” to that Group. With that being said, I’m really not sure about how that data downloads and if the Group activity is included with your personal Profile downloaded info. You can download your Profile info and your Page, but there isn’t currently that option for Groups. Hello! I successfully linked my Page to my secret group. If I post on my Page will it automatically show to my Group members? Or should I post to my Group and will my Page members see? I noticed I can share a post from my Group to my Page. Trying to simplify so all members in both entities see posts. Thanks. Unfortunately, this doesn’t work the way you’d ideally like it to. Linking your Group to your Page doesn’t offer dual-posting functionality in either direction. If you want to do that, you’d likely need to use a 3rd party posting tool. Thanks! Just linked my business page to my groups… but the POST A MESSAGE box disappears on my computer. I can POST a message using my cell phone but not on the computer. Am I missing something? Are you not seeing the Post an Update box on your Page or in your Group? Your capabilities shouldn’t be impacted on desktop vs. smartphone. I have full admin rights on both the groups linked to my page and it worked fine until this morning. Have FB changed something? This sounds like a FB Bug. I’d give it a couple days to work itself out and then try again. Hopefully the glitch doesn’t last long! I love the idea of connecting my group to my page, but I have searched under all the tabs and looked at the each different template and ‘Groups’ are just not an option and I don’t understand why. Any help would be much appreciated. Hi Bazza, Connecting your Page to your Group won’t change your Group’s settings at all. It will remain Closed as you have it and there won’t be any greater access to the Group than there is right now. Thanks! Many thanks. So if I post something in the group will it automatically be visible on the page or are they basically 2 different pages on FB? They are basically 2 separate entities. Connecting the 2 just makes your Group more prominent on your Page (thus making it easier to find and usually increasing the number of people who request to join) and it allows you to post as the Page vs yourself in the Group. There are some Group admins who had wished there was a way they could keep their personal selves out of running the Group. Hope that helps. Thanks! Thank you for sharing all of this very helpful information. I am about to roll out a new private Facebook group for college-age girls and am wondering whether I should link it to the facebook page that I have created for this community or make it a private group. Any suggestions would be greatly appreciated! You don’t need a Public Group in order to link a Group to your Page. If you’d like your Group to grow but still have control over who can see the posts in the Group, perhaps a Closed Group would be a good fit for you? Hi I run a facebook page and would like to link my closed group to it . If I did this would people who like and followthe page see any comments on the.closed group or would they only see the link and that we have an closed group. Has a member I understand that we would see the comments but only members only . I’m asking as i dont want members of the closed group worring that when they comment on the group it can be seen by puplic that are following the page ? Hi Donna! 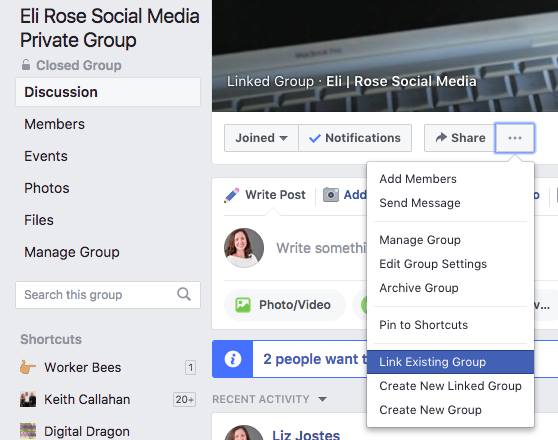 Linking your Group to your Page doesn’t impact any of the Group’s privacy settings, so you don’t need to be concerned that non-Group members will be able to see more than they otherwise would if your Group and Page weren’t linked. Thanks! Recently in the last few days every time I reply in my Facebook group it keeps showing my business page name as the one who wrote it. I always like to respond with my personal name but not sure what made this change? They have been linked for a while now. It happens on the iPhone and on the desktop. I can’t seem to find where I can make this stop. Any ideas or help? Can you see where to change who you are posting as? This is difficult to do on mobile, but much easier on desktop. There’s a small icon on the right side with a down arrow. It should let you switch between you and your Page inside your Group. I am also having this problem. On my iPhone, I can switch between posting as myself or my Page, but on my desktop (Mac), it will only allow me to post as my Page. I see the dropdown, but only my Page is listed there. The only way I can post as myself is to unlink the group. Could that be something that just isn’t rolled out to me yet for whatever reason? Or is there a way around this? This definitely sounds like some glitch you’re running into! There’s no logical reason for you to not be able to switch between personas on a specific device when you can do so on a different device. I also have a Mac, but a laptop, and haven’t had this issue. Have you tried a different browser by chance? So frustrating! Hello! Are you certain you are an Admin of your Page and not a lesser role (like Editor, etc.)? If you could take a screen shot of the Page Role view and email it to me at Info(at)EliRose.com, I’m happy to help. It would be rather odd for Facebook to instruct you that your Page needs an Admin if in fact you have an Admin role (and not a lesser Page Role). Thanks! The privacy settings of your Group do not change as a result of linking. In a Closed Group, anyone can find the group and see who’s in it, but only members can see posts. Thanks! I run a Facebook group, I canâ€™t like my membersâ€™ post after I linked the group and the page. I can only comment as a personal profile. It is important for my group members to see my â€œlikeâ€ as an encouragement to them. How to solve this please ? You have to switch between you and your Page’s persona to post/comment/like as whichever personality you want. On the comment level, you can do this by switching your FB personality between you and your Page on a little box on the right side, just above the comment section. Thanks! When a Group is linked to a Page, you’ll see it listed in the Groups tab when clicked. You will not see an endless list of Groups, however, in the Groups section located in the center of the Page where people find your Posts. You will only see a few linked Groups being displayed (without clicking to see all). 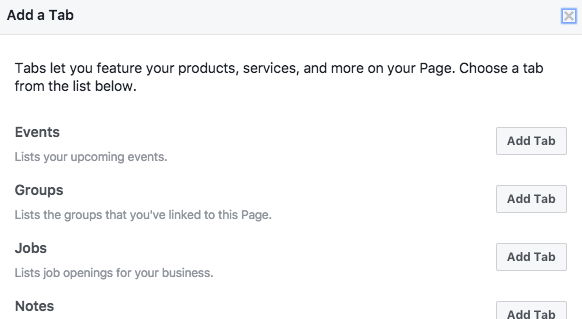 Similar to how Facebook will only show you a few upcoming Events (if you use Events) even if you have dozens of Events you’ve already created for the Page. Hopefully that answers your question. Thanks! So, is there any way to make my personal profile the default for all things on my group? I just changed my group cover photo, that had information in it. The notification posted as my page, not as me. I notice, when “my page” posts things I have very few people seeing it. When I post, MANY more see it…. I went to take my page off as an admin and it sad it would remove my group from my page…… why does FB make things that sound so easy so hard! There is a post attribution setting on a Page, allowing you to set a default like that, but I have yet to find that same setting within a Group. I cannot add my group page? I followed the instructions but under add new, there is no group option? Have you tried first creating your Group (separate from doing it during the linking process)? If not, I’d try that first, and then link them as a second step. Thanks! The content you requested cannot be displayed right now. It may be temporarily unavailable, the link you clicked on may have expired, or you may not have permission to view this page. This is the message while i am trying to post as my page in linked group , How should i overcome this problem. This sounds like a temporary glitch, unless you are trying to share or copy/paste a link to a post from a personal profile. If whatever it is you are posting about is limited to an audience of Friends only, it won’t be something that can be accessed outside of that Profile. Thanks! I found your blog while searching through the internet. I wanted to set up a Group page and did following your steps, but got to a certain point and I can not get into the Group page. I wanted to set it for questions and answers. I’m stuck. It looks like your Group is Public. Typically, those questions are used by Group owners who have Closed or Private Groups as a means of weeding out new members. The questions are asked of “pending members”. If your Group settings aren’t such that you would have a pending status for members, the questions wouldn’t apply. I’m sorry, my explanation might have been confusing. I have my Facebook page for my business as I noted above, but wanted to set up a group page so people can post questions and answer them in the group part of my page. Everything is set up and I see the group page but no one can go into it and post something? I can’t figure what I am doing wrong. Do they only work from a personal Facebook page? I wanted it to be like facebook.com/groups/talkbaja but not sure mine for “Mexico” looks like that. What are the privacy settings on the Group? The choices are Secret, Closed, and Public. Do you currently have any Group members? Also, there are some additional settings where you as the Admin can decide who can post, if posts by others need to be approved, etc. If you wanted me to join your Group temporarily to do some testing, I’m happy to do so. Thanks! Hi there. I linked my page to my group but im looking for a way to stop group activity from showing up as notifications within my Page Inbox. Is there a way to turn those off and only get notifications from Page related content only? For good or bad, this is part of the connectivity of Page and Group. Same thing with Instagram…once you connect it to your Facebook Page, you get notifications on your Page for your IG account. FB calls it a “smart inbox”, but I would disagree with that label. 🙂 Hopefully one day you will be able to better control notifications. No, your Group membership size will not be limited. There are many Pages that have Groups that have far greater numbers than the Page itself. When trying to link the 2 I get an error message. I can link a different group to the page. I can also link a different page to my group. But I can’t link the 2 that are related in topic. 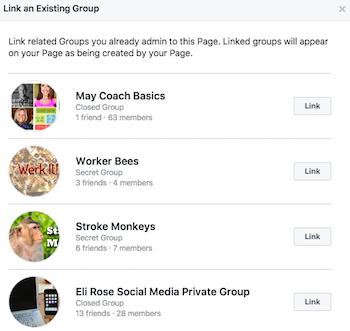 When linking a closed group to a page on Facebook, will the groups posts be visible on the page? If a Group member is viewing your FB Page, they will be able to see them because they are in the Group. 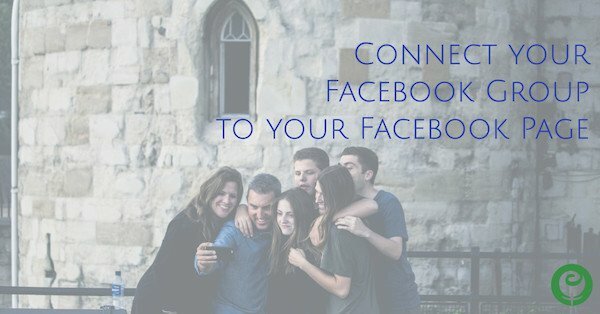 Connecting your Group to your Page doesn’t impact the privacy settings you chose for the Group. Thanks! I was able to link my closed group to my business page. However, the toggle switch to post/comment from my personal account is gone on BOTH. The page and the group defaulted to the page name. I see the drop down, I click it and the only option there to post as is my page name. Are you seeing this both on desktop and mobile? Has it changed in the past few days? Facebook is great at being temporarily glitchy, especially when they are making changes to other things (which they’ve been doing a lot of lately). There isn’t a reason for you to not be able to switch. Sounds like a weird glitch and hopefully it resolves itself. You are seeing those Group posts in your personal feed because you are a member of the Group. Anyone who is a member of a Group, no matter if it’s public, closed or secret, will see posts from the Groups they are in in their personal news feed. So as long as you have your Group settings as you like, who can see what will be taken care of. Hope that helps! I understand that, but what I meant to say is that when I post in the group, my posts are showing on my Facebook business page…I had someone not in the group talk to me about a post I made…and I was so clueless how they knew about this post…until I discovered that the post I made in the group also published to my Facebook business page…this is what I am asking, how do I change the settings so that when I post in the group they will not also publish to my linked Facebook business page? I double checked and yes it’s a closed group…I just can’t understand why my posts are showing on my Fan page…. Can you share the link to your FB Page so I can take a look? Thanks! When I link my group page to my fb page do all of my images as well as members transfer ? Or do they still need to like my page ? No images? Hi Maria! No, nothing is “transferred” from one to the other. It simply helps integrate the 2 for ease of management, and highlights your Group on your Page.